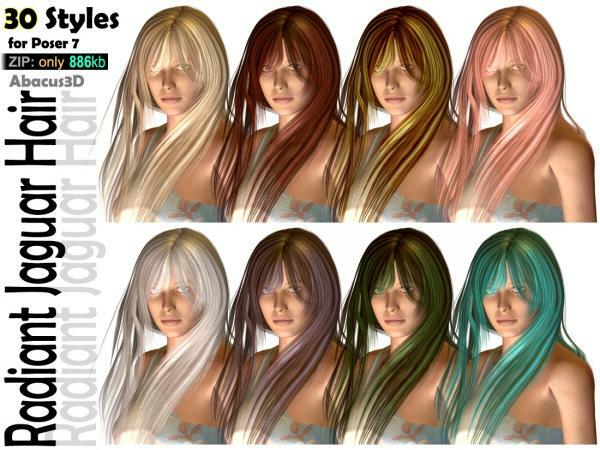 30 fantastic styles for Radiant Jaguar Hair (Poser 7 MAT files). Radiant Jaguar Hair is available in Daz3D marketplace. The included texture was made by myself in Photoshop. SparklingWand (5 years ago) Inappropriate? Thank you for these. They will come in very handy for my renders. Mark Christian Holloway (10 years ago) Inappropriate?